Make a duet with famous artists like Ed Sheeran and Luis Fonsi. It is possible to sing without instruments, singly or with a group. Dance or accompany popular songs. When you sing your favorite karaoke songs, use them with sound effects and video filters. • Free Karaoke with music and lyrics (millions of songs). • You can sing songs alone, duet or instrumentless. • Enrich your vocals with studio effects. • Curtain correction for real-time tuning. • Play in your own music clip. First check your vocals, then add the videos you created. • Share with more than 50 million people to discover. 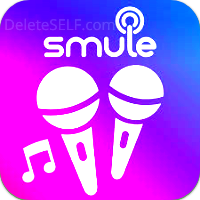 We have also added some web links for Smule enthusiasts. We understand you love smule. Because singing and listening to the song takes people to other countries. Music is the food of the soul. If you want to take a break from this day, you will find the smule link on the bottom of this page. Now you can go down to the bottom of the page to see the delete link and instructions for deleting the account. In order to delete your account, please go to the "Submit a Request" link and choose "Remove Profile" from the drop-down menu. Fill out the form to start the process of account deletion.